Eagle eyed shoppers at prints.co.nz may have noticed that along with the good folks over at our long time ecommerce partners Miva NZ Fine Prints have been testing several different layouts of online product pages over recent months. As we move onto Miva's next generation responsive ecommerce platform our user experience team are working out the clearest way of showing the different mounting and framing options available on prints that we stock on the new responsive page template designs. We also have not been able to resolve whether each main product page should have the same basic layout or if we should have three templates (for reproduction prints/posters, original prints and canvas prints). The split testing on our site was designed to resolve this question as well. A core belief is that we don't want to interrupt customers browsing the site for artwork with cross-sell demands where they are prompted to frame prints before they can checkout. We have thousands of happy customers who have been content to purchase their prints directly without NZ Fine Prints necessarily framing their order as well. Our aim is to offer a standard frame that suits the artwork rather than a custom frame with a multitude of options for a customer to configure. We don't want to offer much beyond a good quality relatively timeless style of frame in black, white or natural timber. For customers who want hundreds of options of moulding type, mat colour and framing styles we can't recommend custom framing heartily enough. Having your prints laid out in a framing studio with framing samples in front of you means you can see both colour and relative size of the framing components in relation to your art print or poster. We support the custom framing industry in NZ to the tune of millions of dollars annually and are only offering framing to cater for the percentage of customers we have identified who only want to purchase artworks ready to hang (an obvious customer is someone purchasing a gift). Custom framing means that you can match an artwork more closely to the room where the print is going. Since artworks are no longer built into the physical fabric of the room (yes, pictures were originally placed in built in frames and were part of the actual wall! We've written previously about the surprisingly fascinating history of picture frames back in 2010) we think there is greater value in placing most emphasis on the frame's relationship to the picture than to its surroundings as a picture can be moved multiple times or go through several re-decorations over the typical life of a modern (long life ink) reproduction print. Thanks to all our customers who have feed back on the different designs. We have decided to have just one product page template for both art canvas and paper prints, the mounting options will be referred to as "Framing Options" even if the "framing" is actually stretching a canvas print around an internal wooden stretcher frame. It just seems to cause less confusion than using technical words like "unstretched" and "stretched", awkward when a customer orders a canvas print that arrives carefully rolled in a tube rather than ready to hang if that was what they were expecting - or vice versa a gift being taken on the plane abroad is not rolled in a tube but in a rather large and cumbersome box! We have some minor work to be done around a new mini FAQ that will go onto every product page plus a bit of programming behind the scenes to manage and inform the delivery timeframes on framed prints - we won't be carrying all the prints in stock pre-framed! 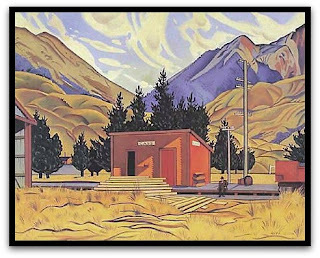 Delivery timeframes should be less than 10 days for a framed print around NZ, a pretty quick turnaround but not like our standard delivery of 3-5 days nationwide. There is also the issue of delivering framed prints outside NZ in a cost effective manner, unless the print has very large overall dimensions we can physically ship the order but the cost of air freight - particularly to the US and Europe - is pretty daunting.